Risk exposures, driven by digitisation, urbanisation and climate change as well as value accumulation and concentration, tend to outgrow insurance premiums, leaving individuals, households, firms and the public sector alike underinsured. 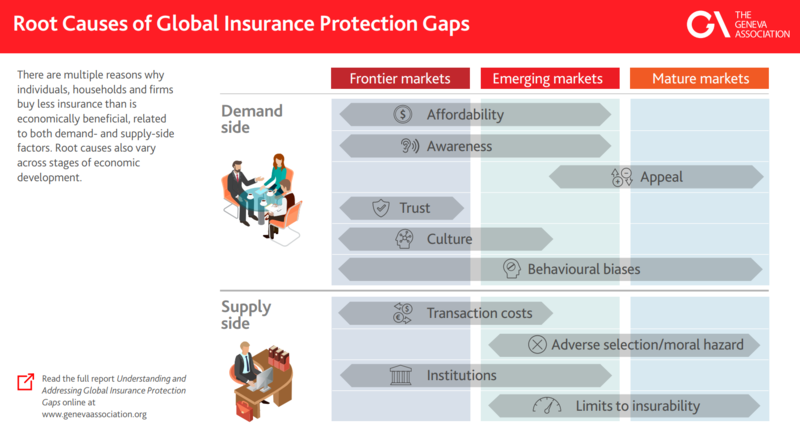 The root causes and prevalence of insurance protection gaps vary widely across the globe, reflecting different stages of economic development as well as social, institutional and cultural peculiarities. 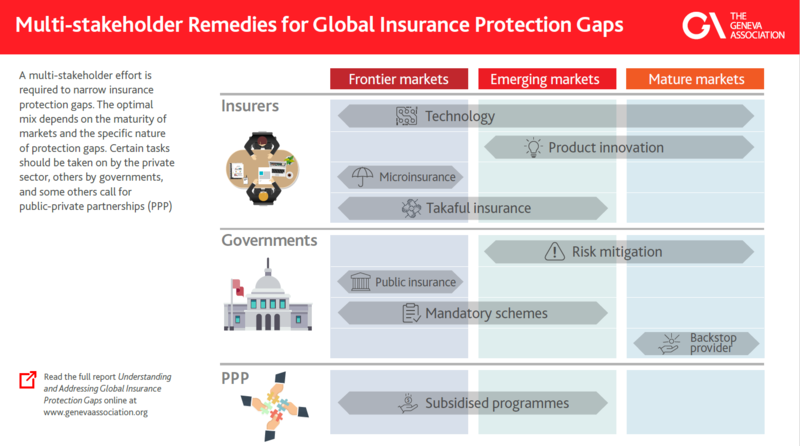 Insurance protection gaps are most striking in developing and emerging markets where combined insurance premiums still fall significantly short of these countries’ and regions’ share in global GDP. Against this backdrop, The Geneva Association offers an updated quantification of protection gaps in the areas of natural catastrophe, cyber, healthcare and pension risk. In addition, we put forward a comparative taxonomy of root causes, distinguishing between high-, middle- and low-income countries in order to enhance the understanding of insurance protection gaps as a function of economic stages of development. Finally, we discuss potential remedies and contributions from insurers, governments and private-public partnerships. Insurers have a vital role to play in this mix of solutions—as well-capitalised risk absorbers, as facilitators of cost-efficient risk transfer and diversification, and as enablers of more risk-conscious behaviours. This report offers an updated quantification of insurance protection gaps in the areas of natural catastrophe, cyber, healthcare and pension risk, and discusses root causes and potential remedies, taking into account commonalities and differences across various lines of business and country income groups.